At the end of Season Three of Ray Donovan, following a shootout with Russian mobsters that left our antihero (played by Liev Schreiber) wounded and his father, Mickey (Jon Voight), on the run, Ray received absolution for his past sins from a Catholic priest who had taken an interest in him in a powerful season finale. Now it's time for Season Four to get underway, and Ray's going to walk the straight and narrow now, right? Think again. Ray's descent back into his old ways begins when he begins an association with boxer Hector Campos (Ismael Cruz Cordova), which soon turns south when Ray needs to use his "fixer" skills to get Hector out of a mess that has to do with Hector's half-sister, Marisol (Lisa Bonet), and the fact that Hector has been having an on-again/off-again sexual relationship with her. But the real trouble comes when the Russian mafia arrives back in Ray's life and wants revenge both for the events of Season Three as well as an incident involving Ray's wife, Abby (Paula Malcomson) that takes place in the Donovan house (and which I won't spoil here). Speaking of Abby, this is a particularly rough season for her, as she learns she has breast cancer, which - at first, as least - she is uninterested in getting treatment for. Abby isn't the only Donovan wife dealing with problems in these episodes, though. Ray's brother, Bunchy (Dash Mihok), is having all kinds of issues with his new bride, Teresa (Alyssa Diaz), who seems to want nothing to do with their newly born daughter after giving birth to her. The highlight of this season - and probably every season - of Ray Donovan is watching the latest scam that Mickey Donovan has gotten himself into. Having had to flee Los Angeles, Mickey finds himself working at a casino in Primm, Nevada, using an alias (since he's wanted by the law). Not only has he taken up with the casino's lounge singer (played by Paula Jai Walker), but he's got a plan to steal a gold horseshoe the casino has on display that holds $1 million dollars inside. Anyone familiar with this series already can guess that Mickey's heist does not go as planned. I can't say that this is the best season of Ray Donovan...I personally liked the third season a little more that this one, I think. However, that's intended as a compliment as all four seasons of this Showtime series have been quite entertaining. When the show started back in 2013, it felt like it was trying to be a West Coast version of The Sopranos; but it didn't take long for the series to establish its own identity, and it's been solid ever since. While the lack of a Blu-ray release still makes streaming the best option to watch these episodes (since they can be viewed in HD that way), those without a Showtime subscription will want to consider picking up this DVD release. Season Four of Ray Donovan arrives on DVD in a clear case, with the four dual-layer discs held on a pair of plastic hubs inside. The only insert is an advertisement for Showtime's streaming options. The reverse side of the case's slick (seen from inside the case) has a list of all the episodes from Season Four, listed according to what disc they appear on and with a short synopsis of each. Also listed are the bonus materials according to which disc they appear on. The DVD case slides inside a cardboard slipcase featuring the same artwork that is on the slick. There are no front-loaded trailers on any of the DVDs, and the main menu features a still photo of Ray on the left, with a montage of footage from the season in the upper right and menu selections on the lower right. Each episode of Ray Donovan is shot digitally on Arri Alexa cameras and presented here in the 1.78:1 aspect ratio using an MPEG-2 codec. For whatever reason, Showtime has decided not to give Ray Donovan a Blu-ray release (which the first three seasons all got), leaving this DVD set the only option for those who don't subscribe to Showtime. But as DVD transfers go, this one is pretty good. The overall image of the show leans towards browns and yellows (particularly in indoor shots), although that changes depending on locations (the art gallery seen in this season, for example, is bathed in whites). While details aren't what you'd see in a 1080p image, they're pretty good for standard def, and I didn't note too many glaring problems - a touch of aliasing and jittering of the image here and there - but nothing unexpected, and certainly nothing that was so obvious it distracted from my enjoyment. The only audio option on these discs for each episode is English 5.1 Dolby Digital Surround, but as lossy 5.1 goes, these episodes sound pretty good. Dialogue is primarily front and center throughout these 12 episodes, with the surrounds primarily used for enhancement of the musical soundtrack and ambient noises. 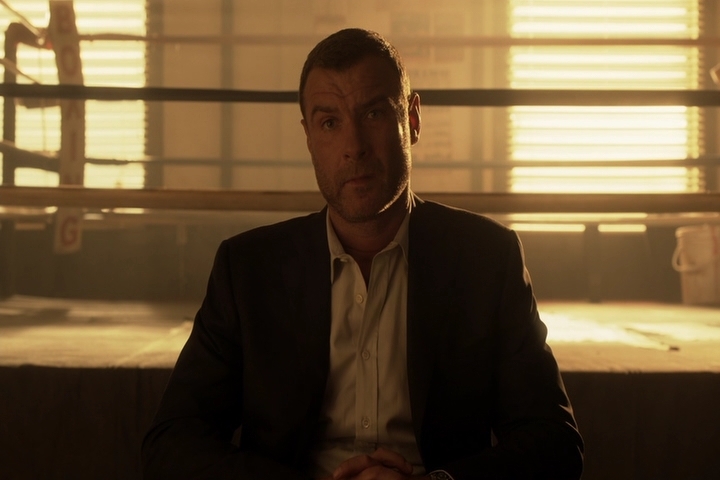 Keep in mind though, while Ray Donovan does have bursts of action and fisticuffs here and there, this is still primarily a series that focuses on the interaction between the characters - so while the audio tracks here aren't always "showy," they are well rendered. Subtitles are an option in English SDH only. Character Profile: Ray Donovan (1:03) - This is a brief promo piece for Season Four featuring Liev Schreiber talking about his character mixed in with footage from the series. 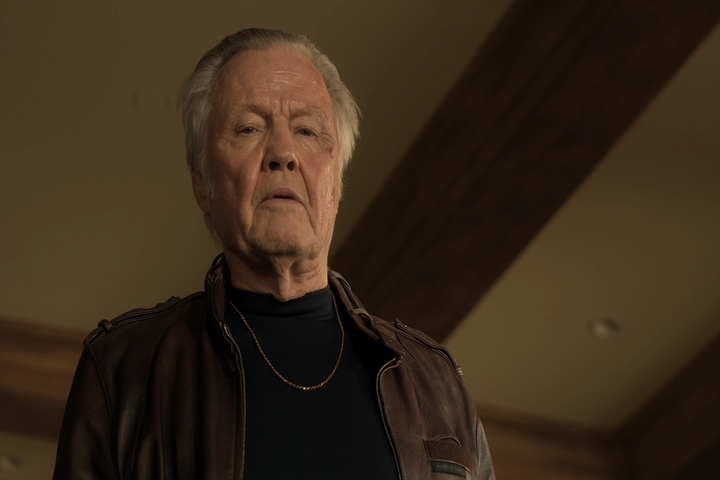 Character Profile: Mickey Donovan (1:33) - Actor Jon Voight talks about what's in store for his character in this new season. Like the Ray Donovan piece, this one also features footage from Season Four (and a couple moments from Season Three). Location: Primm (8:06) - Executive Producer David Hollander tells viewers about the decision to put the character of Mickey Donovan in Primm, Nevada, at the beginning of Season Four. Also included here are comments from Executive Producer Lou Fusaro and Production Designer Ray Yamagata, along with the real-life Assistant General Manager of the Primm Valley Casino Reports, Kenji Hall, as well as the founder of Primm, Gary Primm, who named the town in honor of his father. Female Strong (10:32) - There's an on-screen warning before watching this featurette that it contains revealing scenes about Season Four. In other words, this is the one featurette you don't want to watch until you've seen all the episodes. As you might have guessed from the title, this takes a look at the female characters in Ray Donovan and includes comments from Executive Producer David Hollander, Paula Malcomson ("Abby Donovan"), Embeth Davidtz ("Sonia Kovitzky"), Katherine Moennig ("Lena"), and Kerris Dorsey ("Bridget Donovan"). Ray Donovan's fourth season may not mark the apex of the series in terms of quality, but it continues to be entertaining "appointment" television. To say that Season Four provides "more of the same" isn't an insult - it's an acknowledgement that this is one of the few series on television that has managed to keep my attention over the course of its run. Those who have followed the series up until this point won't be disappointed by what unfolds in Season Four. Recommended.